So... the summary is that we are making (or trying to make) a new text adventure for the CPC and I would like to share the progress of the game with you . I am designing the adventure and I will try to code it as well, at least the main part, using PAWS (although I do not know if I will need some help!). In the meantime, a great friend of mine is creating concepts and doing the pixel art for the locations, and we are both discussing the plot and the background of the game together. Later, we will polish the game with the help of MiguelSky, that has lots of knowledge and experience, and we will probably need some testers and people to proofread the text (the game is in English but I am not a native English speaker and I am sure that it will need lots of corrections). Everybody that likes text adventures is very welcome to help . Here is the concept of the main character, the name is Mike. And one of the first graphics. This is the original GIF. We still do not have a tittle, by the way. 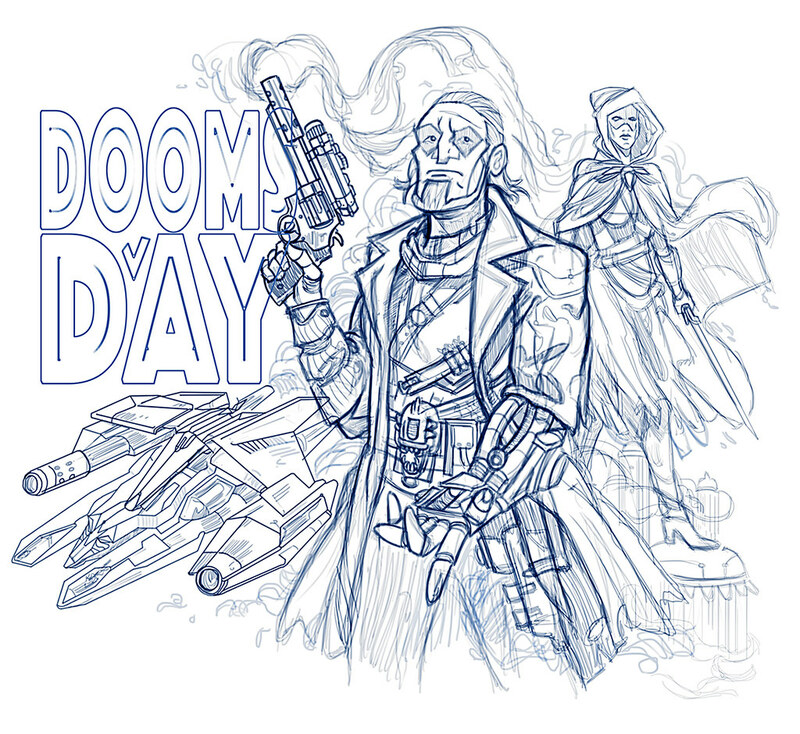 Doomsday is the name of the spaceship! . But we can still get one! Great you like it so far guys! Let's see how it works. At the moment we are still fighting with the map and the overall script. It has quite a lot of locations (more than 35) and it is somehow difficult to make everything as consistent as we would like. When you think that everything is under control another possible weakness appears . Very well! Glad to see your posting here! About that picture up there. You could use MODE 0, since in that pic all angels of line are rel. flat, so the pixel are wide. That would give you 16 colors and the resulution would be still good. Perfect then !! For Nheredia I used conversions from the original PC game pictures. Sooo...we have made very good progress with the description of the locations, the map and the overall structure of the game. Sadly, the truth is that since I am not a native English speaker I am afraid that my descriptions are far from correct or, at least, will have a lot of typos. I was wondering if somebody could help us reading and correcting them (just the description of the locations for the moment). Ideally, this "somebody" should be a native English speaker that likes science fiction, because the games takes place inside a big space station. The text is not very long, just a few pages, and I would sent it to the volunteer during the next days . We have introduced all the locations and the connections, so it is possible to visit all the map. Once compiled the whole file is 13 kas. I hope we will have space to put everything we planned without making sacrifices, but there is still a lot of text to add (the descriptions and other messages). Does anybody know how to use 128 kas with PAWs? is this even possible? :? P.D: we still need a proofreader!! Have you planned translations to other languages? Well, if I find some time then I would be glad to translate it to German. I may not be a native English speaker and I make the occasional mistake but I can proofread pretty well, if you need a second volunteer! If you need too, my daughter can translate into French and German - she's fluent.. I can check the German translation. Almost done with the descriptions; I've got to say what I'm seeing is quite intriguing, looking forward to the game! I am back from holidays!